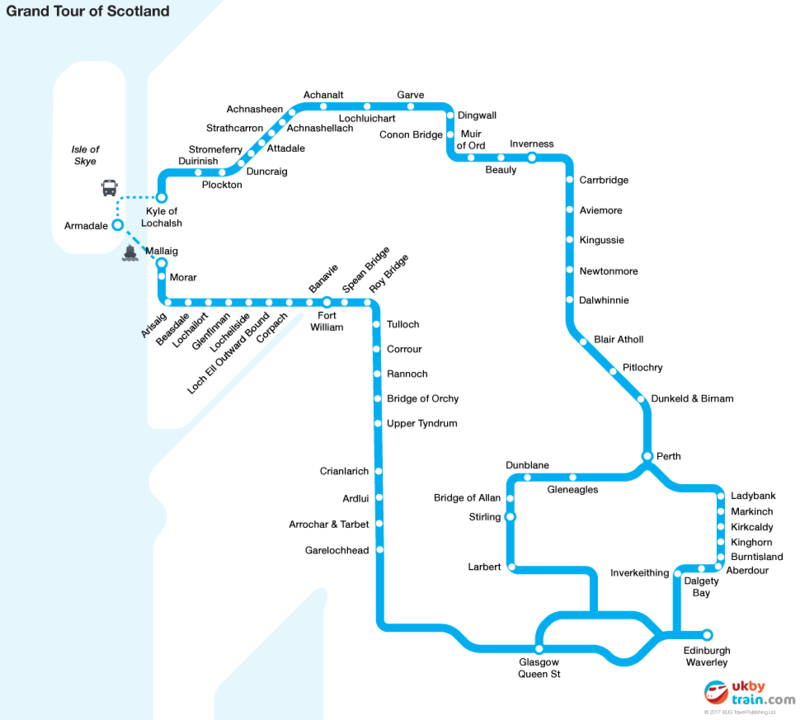 The Scottish Grand Tour (formerly the Grand Tour of Scotland) rail pass lets you travel on ScotRail trains along a circular route that takes in the highlights of Scotland. The route includes Edinburgh, Glasgow, Fort William, the Isle of Skye, Inverness, Aviemore and the Cairngorms, Perth and Stirling. The pass gives you four travel days within an eight day period. The pass is good for travel in one direction only: your choice of either clockwise or anti-clockwise and you can break your journey at any of the stations along the route (shown on the map below). The Grand Tour of Scotland pass also allows includes some travel by ferry and coach, which means that you are able to visit the Isle of Skye. Bus and coach services operated by Stagecoach between Armadale on the Isle of Skye and Lochalsh. This includes route 51 (which runs directly between Armadale and Kyle of Lochalsh) and routes 50, 52, 152 and 917 (which involve changing at Broadford/Armadale Road End on Skye). You can buy the Scottish Grand Tour rail pass and download it directly to your phone. Click below for details about international prices. This rail pass is valid for standard class travel on ScotRail services at any time on the West Highland Line (Glasgow–Fort William/Mallaig) and the Kyle Line (Inverness–Kyle of Lochalsh), but you on weekdays you must travel after 9.15am on the Highland Main Line (Glasgow or Edinburgh–Inverness via Perth) and on services between Edinburgh and Glasgow. On weekends you may travel at any time on any line. Apart from these time restrictions, you are able to travel on any train and advance bookings or reservations are not required. This pass is available for everyone, regardless of where you live. You can order it online and have the pass sent to your mobile phone. If you live in the UK you have three months from buying the pass before you have to start using it. If you live outside the UK, you can buy this rail pass up to 11 months before you start using it.